And a Merry Christmas to all of you too ! 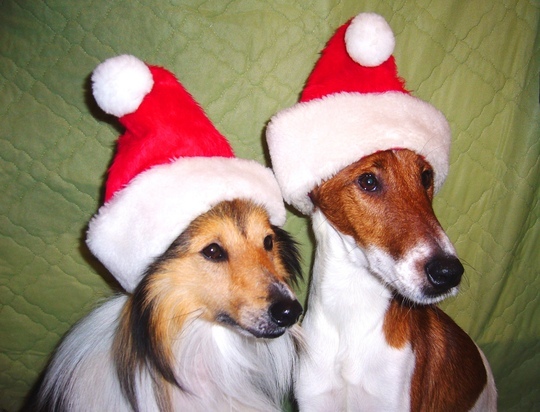 Lovely picture Terra they both look very dashing in their Christmas Hats got to go on My Favourites, a Very Happy Christmas to you all with lots of hugs and xxxx for the boys and a cuddle for Crocus. Ah How could Santa refuse them anything they wanted , they look to be such good friends .. He's behind you!!!!!!!!!!!!!! Oh no he's not!! Oh yes he is!! Bless 'em both - and you and Crocus, Terra. LOL Only six days to go, boys. LOL... but Truffle's birthday is this weekend..
...is anything else happening that I don't know about yet? Last Christmas I was a tiny puppy with my eyes shut..
Terra ,the first pm I received from you was an enquiry about road conditions near me, the answer was atrocious because of the very bad snowfall during the night,you were collecting Truffle !!!!! hows that for coincedence ,its his birthday weekend and we are in the same boat...LOL..
What a brilliant photo, TT. Truffle is taking it very seriously but I swear Conker is smiling, bless him. Happy Christmas to you all and best wishes for the New Year. God bless. You're right... Truffle takes his hat-wearing very seriously..Lol. Aww gorgeous photo TT,they are ready for the cold and Santa too ! Happy birthday to Truffle,how he has changed in one year. Yes, Truffle's birthday... can't believe he is already a year old... grown a lot in that time ! Lol. How beautiful is that . Thanks, Neellan, Lexxie, Tilly, Pitta, Jacque, Phil, Summer & friends.. Truffle received a rope toy for his birthday and he and Conker have been enjoying tug games all day... Truffle is very honoured that so many people have put up lights and trees to celebrate his birthday... Lol. Such a cute photo! Have a Very, Merry Christmas! unless it was pocket size. Anyway we get a lot of joy from Baxter, who treats our house as his second home ; but lives next door. A wonderful Christmas picture, I hope today is merry for you. Crikey...how did I miss this? Sometimes I think I am away with the fairies...or was it Santa?!!! I did thank you Terratoonie, hope Conker and Truffle did too and had lots of pressies. Yes, thanks... you can see some of their gifts on my latest blog asking When do you know that Christmas is over. ? Lol. I shall have a look thank you. It was Little Suzes first Christmas and I think I might have to change her name to Kim or Aggi, as she refused to sit with either me or my husband until the wrapping paper and presents were to moved from the living room! I hope you've sorted out the problems with resizing your photos.